Characterful four bedroom semi-detached stone cottage with many traditional features in a lovely village location with spectacular long distance views, private parking, south facing rear garden & patio area. The property is constructed of stone work with pitched slate roof supported on timber. Composite entrance door, decorative bull’s eye side window with circular stone, cloak hanging. Stone flagged flooring, double panel central heating radiator, beamed ceiling, fitted storage cupboard. Double glazed stone mullioned window to front elevation with timber panel window seat, herringbone set oak ‘Parquet’ flooring, beamed ceiling, ceiling and wall lighting. Dressed sandstone ‘Adams’ style fireplace with handmade brick back and stone hearth housing a log burning stove. Traditional oak panelled entrance door with double glazed timber windows to either side with stone window bottoms, double panel central heating radiator, beamed ceiling, timber staircase leading to first floor accommodation. Double glazed stone mullioned window to front elevation with stone flagged window bottom, double panel central heating radiator, beamed ceiling. Range of quality fitted base and wall units with complimentary light granite work surfaces and splashbacks. One and a half bowl enamel ‘Belfast’ sink with brushed steel mixer tap and ‘Quooker’ boiling water supply. Double glazed timber stone mullioned windows to front elevation with timber louvered shutters. Built in five ring ‘Neff’ gas hob, ‘Neff’ electric oven, ‘Neff’ brushed steel and glass extractor canopy with Illumination, ‘Neff’ fridge freezer. High level built in ‘Neff’ microwave. Built in ‘Neff’ dishwasher. Stone flagged flooring, low voltage spotlighting to ceiling, beamed ceiling. Built in black enamel gas fired ‘Esse’ stove supplying heating to the room. Matching breakfast bar between kitchen and dining area. Double glazed timber French doors leading to rear gardens and patio area, stone flagged flooring, double panel central heating radiator, beamed ceiling, low voltage spotlighting to ceiling. Built in cast iron ‘Range’ with living coal and gas fitment (presently inoperative). Range of fitted base and wall units with ‘Belfast’ enamel sink, tiled splashbacks, plumbed for washing machine, ceramic tiled flooring with diamond set corners, double panel central heating radiator, built in cupboards and drawers. Low level w.c, pedestal wash hand basin, diamond set ceramic tiled flooring, ceiling lighting. Attached single garage with an electrically operated up and over door, concrete flooring, light, power and water installed, wall mounted ‘Glow Worm’ gas boiler providing central heating and domestic hot water. Traditional timber staircase with timber balustrade and spindles. Open landing area gaining access to bedrooms. Double glazed timber stone mullioned window to front elevation with stone window bottom, single panel central heating radiator, original timber truss beamed ceiling. Walk-in fully tiled shower cubicle with chromed shower fitment, ceiling lighting, double ‘Duravit’ sink with chromed mixer tap and sliding drawers beneath, tiled splash backs, low level w.c, ceramic tiled flooring, chromed radiator towel rail, extractor fan, beamed ceiling. Double glazed timber windows to front and gable elevations both with stone window bottoms, single panel central heating radiator, original beamed timber truss ceiling. Double glazed timber window to gable elevation with stone window bottom, beamed timber truss ceiling, low voltage spotlighting, timber panelled wardrobes, double panel central heating radiator. Double glazed timber window to front elevation with stone window bottom, timber truss ceiling, single panel central heating radiator. 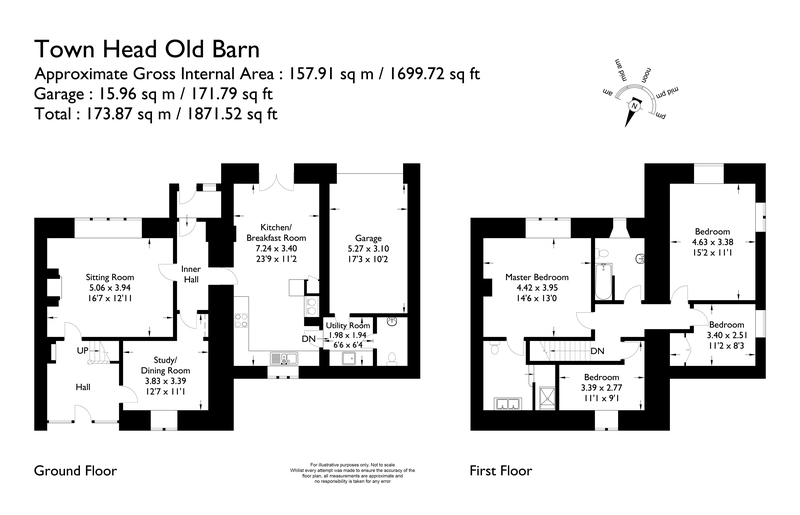 Three piece suite comprising traditional timber panelled bath with ‘Mira’ electric shower fitment, pedestal wash hand basin, low level w.c, ceramic tiled flooring, timber panelled half walls, timber truss ceiling, double glazed timber window to rear elevation. Traditional cottage garden to the rear, south facing elevation, mainly laid to lawns with flagged patio, raised beds and parking area. Small stone walled raised garden area to front elevation. Council tax band F payable to Ribble Valley Borough Council.